This year National Grandparents Day is September 10th. If you were wondering, in the USA it’s always celebrated the second Sunday in September. And around the world, there are similar annual holidays and celebrations to honor grandparents But; honestly, any time of year is a great time to appreciate the role of that special someone or group of grands in your child’s life. 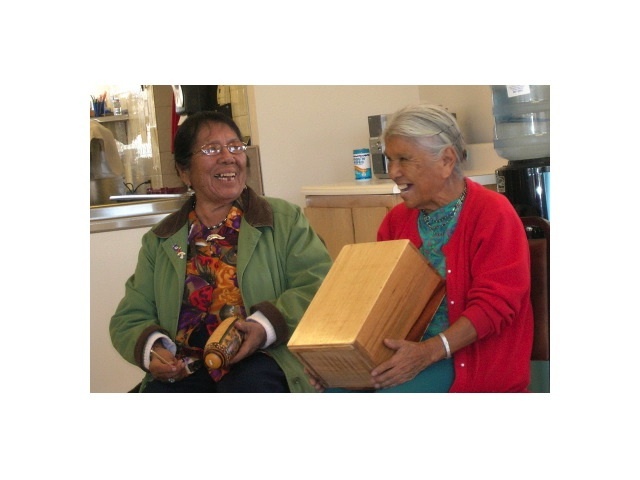 One easy and fun way to bring generations together and make lasting memories is through sharing music, especially the simple or special songs that meant a lot to grandma or granddad. In our family, our Greek Xiaxia shared a version of patty-cake in Greek that the kids remember and sing to this day. Their other grandmother loved to tell them about the silly songs she sang at school like “Three Little Fishies” and “Jadda, Jadda Jing Jing Jing!”. Because these songs mean so much to old and young alike, I created a CD of songs that were hand-picked by my fans and audiences in response to the question: “What songs would you most like your grandkids to hear”. The result (and it’s a give-away below) was a CD called Grandchildren’s Delight and it includes songs like You Are My Sunshine, Grand Old Flag, This Little Light of Mine, Oh Susannah, Playmate and so many more. So please, enter to win below but also remember how music can bring old and young together. I bet there’s a special song you recall from your childhood or memory that’s just waiting to be sung to your little one! Yes, I am still asking folks about favorite songs from their childhood or their parent’s era. Either from the USA or anywhere around the world! Do you have a special song from jump rope, summer camp or a holiday you loved? If so, let me know. I’d love to share it with my readers and my audiences. This entry was posted in Babies and Music, Early Learning With Music, Family Fun, Favorite Songs, Holiday Songs, Silly Songs and tagged childrens songs, Daria, Daria Marmaluk-Hajioannou, Grand Old Flag, Grandparents Day songs, Intergenerational songs, kids songs, Oh Susannah, Playmate, senior songs, songs for grandchildren, songs for grandkids, This Little Light of Mine, world music with daria, You Are My Sunshine. Bookmark the permalink.